So, this State of Topaz has been like a month in the making, I'm sorry about that. On the bright side, when I originally mentioned to Cyndadile that I was going to write one of these last month, he asked "Is there even enough content to write about"? I was confident that yes, there was. But now there's even more! Some really cool things have been happening recently and I'd love to share them with you so you can hop onto the ship and know where you can help out. First, however, I have a very important announcement to make. (Followed by two more). The results of our mod applications are in (well they were in a while ago. My fault.) and I'm happy to announce that longtime Topaz stalwart Cyndadile has been given the position of Global Mod and assistant project leader. Please give him some words of encouragement, and thank him especially since he's been doing recently even without having been yet given the powers. 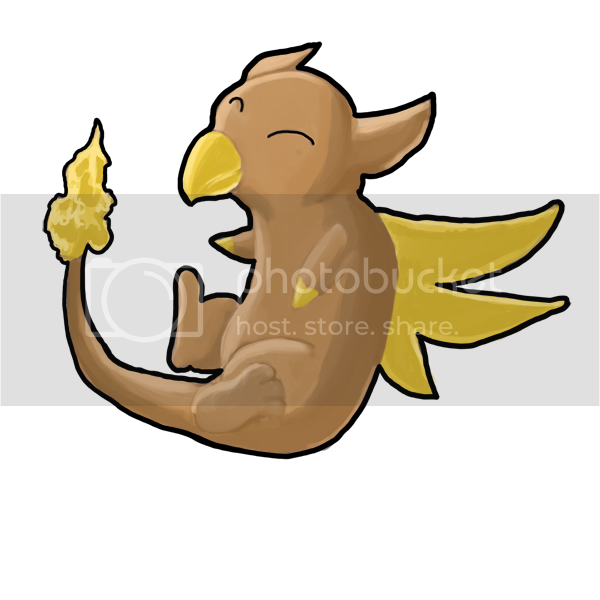 As an additional announcement, NyteFyre will be taking on the role of Topaz Text RPG administrator and will manage all aspects of the TRPG. I hope he will be able to do far better than I ever could with my extremely limited TRPG experience and help build our community through the TRPG. If you wish to help in the development of the TRPG, send him a PM, and we'll work out something probably involving a TRPG staff forum to really get this rolling. The second announcement is both good and bad news. The bad news is that Triumph has gone MIA and once again we're left without a dedicated programmer. However, the piece of extremely good news is that this isn't the roadblock it was before. Black Temple Gaurdian, in particular, has done some excellent work examining the moves codes and has started steadily using the work of past programmers to build, at least partially, the code that will get our moves into the game. I think the time has come for us to make the decision that we can't rely on catching a windfall programmer to come and rescue us by doing all the stuff we feel we don't know how to do. There's a great wiki which helps us realize all the light scripting work that we can do right now. Since the work will be done in house, we don't have to spend months courting a programmer for them to go MIA and for none of the work to be on hand to do something with. We now will have the files for what is worked on in Topaz. That's not to say that we won't need programmers! I'd still love for some with Ruby experience to come in and help out on the hard stuff. It's just that we won't need to depend on them specifically and instead we can try to steadily build our game together. A lot of this SoT will be telling you how you can help out with this, so please come and do! A lot of us are inexperienced but progress is being made and it can only get better with more people helping out. 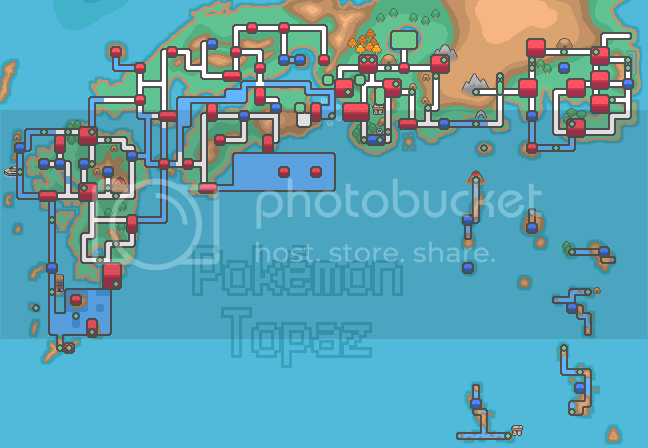 Finally, Topaz has decided to open a joint Pokemon Online server with Pokemon Turquoise and Ever Grande City, which can be found at IP address 74.140.201.198:508. The server name is Jirachi's Lunar Comet, and it'd be awesome to see some of you on there so I don't have to wade into a sea of strangers the next time I appear. So come on in and we can figure out that daunting new 5th gen meta together! Thanks to Saeyru, Skyler and Chronicler for opening up the server, they did it in token of goodwill so let's visit the server often and play a little! In tune with our ideas of doing as much programming as we possibly can as a community, we have Trainer Lineups. This went off to a blazing start, which is awesome considering that TehLurker and I ended up doing all the work last time with basically no one interested in helping. There are two (technically 3) parts to this part of the project. First is figuring out how many trainers are on each route, who they are and what Pokemon they have. Second is writing them into the format of trainers.txt so the game can read them, and this involves creating new trainer types for Topaz's new trainer types. Both sides need work, so come on in and help out! One particularly good suggestion that has come up on the part of Zainia is to change our route numbers from 201+ to 49+ to avoid conflict with Sinnoh. I'm all for this idea but it does require some work on my part to find where things need to be changed and change them. One way you could help me, first of all, is showing your approval for this change in the Suggestions Topic so I know it's worth it. Next, if someone could point me or Cyndadile at any of the topics where route numbers are mentioned, then we'd have an awesome checklist and be able to change them as we went. One way anyone with access to RPGMaker XP can help is by helping to recreate the maps found on the site and posting them to Map UPS. This has been my project for the last little while but it honestly takes quite a long time even though the maps are already made so those who don't know how to map very well can learn from the master that is Fangking Omega by recreating his maps. Alternatively, if you do feel confident enough in your mapping abilities, most of Kirant remains unmapped, as do all of our routes past Route 205. This is the kind of job I'd actually like to be doing but of course demo retains priority so the recreation of maps plus makings of Cranewing City interiors would be very much appreciated. Another way you can help on the programming front is something called Event Indexing. In here, what we do is take all the NPCs, bookcases and such found here, and then describing their place to make it easier for the programmer (who in this case is probably going to be me) to place them as events on the map in RPGMaker. Once again, this is a way to directly contribute to the demo so the more people help out here the faster the demo and ultimately the whole game will be. 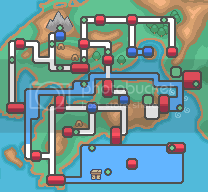 (And there's really only 3 more cities left to do, routes for the most part contain only NPCs and trainers which is pretty easy). 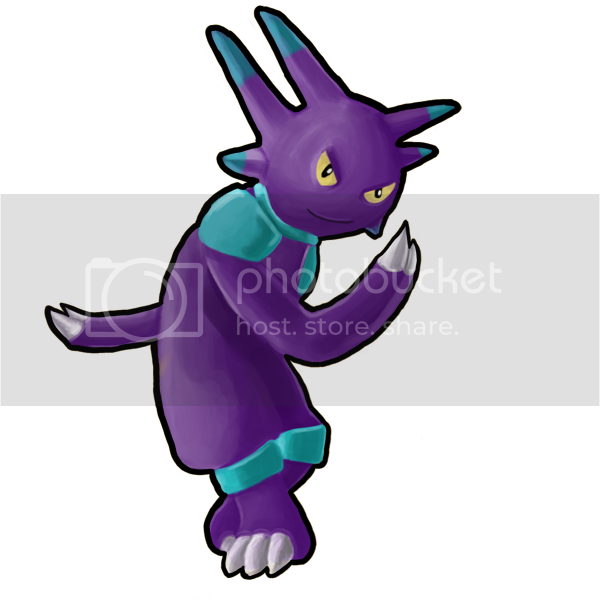 On the graphical side, Reliability and I are having a small disagreement on what size Kuranpu's backsprite should be. I believe it's better for it to be larger since it's simply closer to you, whereas he maintains that Kuranpu's 3'3" size makes the smaller size more coherent. Who is right? Up to you. Tell us here. As a small side note, thanks to all of Reliability and X-Antibody's efforts pretty much all the backsprites are at the A standard, only 7 Pokemon still have what would qualify as a placeholder sprite. Some of them (Embear) aren't too difficult so for those who've rested their spriting chops at Topaz long enough it might be high time to take a stab at them (especially Embear since it's in the demo). Come to the topic for more details. Further graphical awesomeness for this SoT is Cranky Guy's foray into the realm of overworld spriting, giving our overworld a bit more Topaz flare with some Topaz Pokemon! There's Engil: , Duval: and Mirust: . You can give some comments and suggestion on his topc, I'm sure he'd appreciate it. Even cooler is that he went ahead and placed it within the context of the whole Pokemon world! Now that's some inspiring stuff. Go give him the praise he deserves here! Super polished and super stylish, true to Topaz form. Meanwhile, Sev has been experimenting with Topaz's battle GUI and Cyndadile with some trainer overworlds. Finally, and most excitingly, Black Temple Gaurdian laid out the groundwork for most of the Topaz moves that Leithality and Badara didn't create themselves. He still needs help on some of the trickier ones though! If you're interested in helping him out, PM him, me or check out the Moves Programming topic.